The feature of engagement ring is an 8 mm (1.90 Ct) round cut top grade cubic zirconia stone in center with a prong setting, alongside with 42 smaller stones. The feature of matching engagement ring each comes with 14 round cut stones in a pave setting. The total carat weight is 2.18 ct (approximate). The feature of men's ring is width 8 mm and the thickness is 2-2.5 mm. Titanium rings are the kind of rings which are very tough and very long lasting. 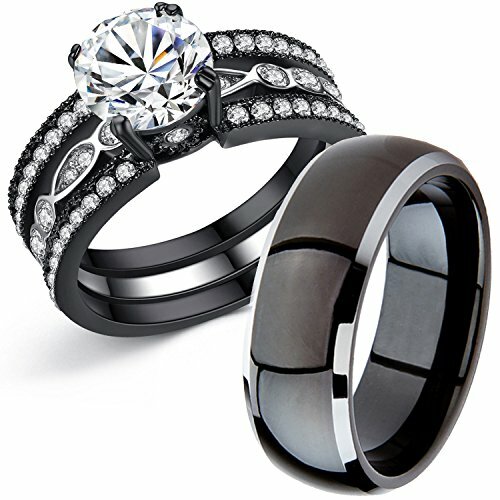 3 PIECES MATCHING RING SET PROMISE COUPLE RINGS: Bridal 2 pieces women's cubic zirconia round cut stainless steel wedding engagement ring set with men's 8mm wide black Titanium groom wedding band. 100% nickel-free. Hypo-allergenic, Never Green! GIFT BOX INCLUDED: The Rings will come in a free nice gift box. Ready to give to your partner. You just have to find the right moment and time to present it to your future bride. OUR PROMISE 60 DAYS MONEY BACK GUARANTEE: We offer a 60 days return policy with FULL REFUND NO RESTOCKING FEE. We want you and your partner to 100% happy and satisfied with your rings. If you for any reason don't like your rings, you are able to return it for a hassle-free 100% Money Back Guarantee.